I have spent years seeking out the perfect equipment to help me nail that classic American sound. I endorse the following companies, not only because they make amazing gear of the highest quality, but because they are seriously committed to the preservation of the drumming art form, and the legacy from which we have all grown. I am eternally grateful for their support. Daniel proudly endorses Drum Workshop (drums, pedals, hardware), Sabian/Crescent Cymbals, Vic Firth Drumsticks and Brushes, Aquarian Drumheads, LP Percussion, Ahead Armor cases, Drumtacs sound control pads, HQ/Real Feel practice pads, Booty Shakers drum isolation mounts, and Power Wrist Builder practice sticks. Most of the equipment described in this section can be seen in the photo to the left. 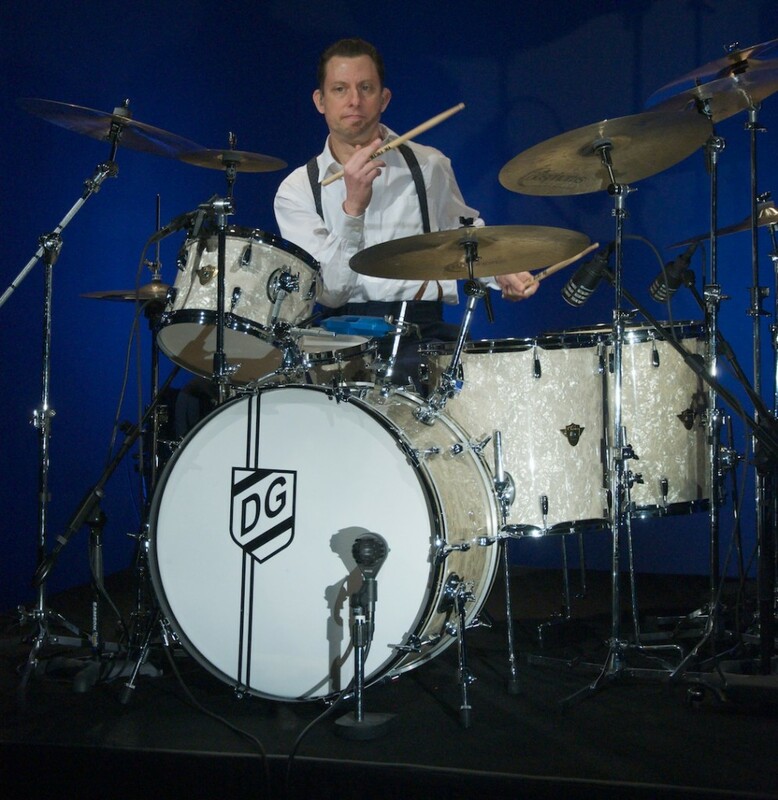 I play DW’s Classic Series, drums that are specifically designed to capture the same warm, rich sound as the old Radio Kings and WFL’s. For someone who is a fan of vintage drums, you will not get any closer to the real deal than these. Features include: Poplar/Mahogany shell construction, vintage style “butter” bearing edges, and bass drum mounted hardware for rack tom, ride cymbal and splash. You can have your drums wrapped in a “Vintage Marine Pearl,” giving them a cool “aged” look. I recently joined the Vic Firth family as both an endorser and an education specialist. It’s a thrill and honor for me to work with a company that has such a rich legacy and stellar reputation. Currently, I’m using the VF 5A and 85 A models, along with the Heritage Brush. Zoro and I recently recently released a poster with Vic Firth entitled We Want the Funk, which details the evolution of R&B grooves from 1948 up to 1980. Latin Percussion (LP) – Makers of the finest hand drums and percussion instruments in the whole wide universe! I’ve been part of the Crescent cymbal family for more than a decade. Steeped in the heritage of Turkish craftsmanship, Crescent cymbals are thin, dark, complex and always musical. Simply perfect for the complex requirements of jazz and swing music. In 2014, Crescent was acquired by Sabian, and the newest lines have beautifully retained a sharp focus on crafting traditional instruments with the reliability, durability and quality for which Sabian is renowned. In my setup, I use a variety of Sabian and Crescent models, including: Classic, Elements, Vanguard, Artisan and Evolution. I’ve been a big fan of Aquarian heads for years, particularly since discovering their Vintage series. The Aquarian Modern Vintage heads are the closest approximation to calf heads on the market today. They are incredibly durable, have a great coated surface for playing brushes, and offer a warm, rich sound that must be heard to be believed. I use the Modern Vintage heads on my bass drum, tom toms, even my snare drum (if I’m doing a lot of brush work). I also use Aquarian’s Satin Finish heads, which sound amazing on snares and toms. Revolution make some really cool and innovative products, including a two-way tuning key and a free standing stick bag. They’ve recently launched the incredible Ahead Armor Case line of high quality bags in conjunction with Big Bang Distribution. Power Wrist Builder practice sticks: Great metal sticks that . . . well, build power in your wrists. Pure Sound Snares: Highest quality snare wires for any playing situation. Phatfoot Harness: Keeps your bass drum from sliding.